Specializing in portraits of horses, dogs, cats, cattle and an occasional owner/rider. 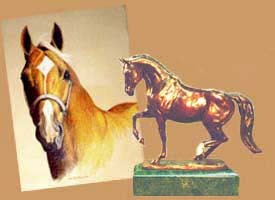 Unique portraits are available in bronze sculpture or pencil (graphite: black & white or PrismaColor colored pencil). Now taking a limited number of commissions in 2019. * All pencil portraits are drawn on acid-free paper. * Black & white portraits are drawn with graphite pencil on pure white Strathemore Bristol drawing paper. Pencil sketches start at $300.00. * Colored Pencil portraits are drawn with PrismaColor pencils on various colors of acid-free artist papers. Prices start at $650.00. * Graphite (black & white) pencil portraits of horses. * Colored pencil portraits of horses. * Portraits of horses with their owners/riders. * Portraits of dogs, cats and cattle. Click here to see sculptural portraits in bronze. Click here for information about ordering a portrait. "Horses of a Different Color"
Customized Breyer Horses painted to your horse's likeness! "Horses of a Different Color" Portraits. Limited edition bronze sculptures for sale. Original pencil drawings for sale.